Want to learn which food is the best cat food for urinary tract health so your cat can live a longer life? You’re on the right page. Adults cats often suffer from dehydration, which causes many felines to develop urinary tract problems in life. Learn how to better take care of your cat’s urinary tract health by providing a suitable, nutritious diet. Cats are one of the most discreet pets with a mature grooming aptitude. They quickly learn how to use the litter box at a young age. As long as you keep the litter box clean, they’ll maintain this behavior whenever they want to answer the call of nature. So, when you see your adult cat change and urinate outside the litter, for example, there may likely be an underlying urinary tract problem. Try not to worry too much at first, because in most cases, you can correct that with a simple change of diet and a visit to the vet. Always consult a vet if you identify your cat is having trouble urinating, is peeing outside the litter box, has blood in the urine, or has trouble passing urine at all. Urinary tract issues are actually some of the most common problems in cats. Fortunately, you can identify the causes and symptoms so you can tackle them before they turn into a deadly disease. One of the ways to optimize a healthy urinary tract is by feeding your cat the food designed for cats with urinary tract problems. Most of the time, this is done with a specially-formulated diet (see cat foods below), coupled with a high-moisture intake strategy. Avoiding a dry-only diet is one way you can help minimize the chances your cat develops UTI-related crystals. How do you choose the right food for your cat’s urinary health? Choosing the right cat food should be something you pay more attention to so that your feline can maintain a healthy urinary tract and experience less illness as they age. 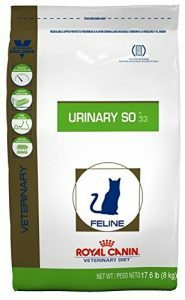 See our selection below for the best cat food for urinary tract health, whey these work and which one may be suitable for your cat. This food contains an optimal amount of magnesium – not too much or too little. This makes it easy to control the magnesium content in your cat’s which benefits the whole urinary system. Also, the food helps in eliminating hairballs – which are a result of your cat’s grooming process. Your cat needs enough fiber in her diet to shed hairballs properly. Fortunately, Hill’s Science Diet Cat Food comes with natural blends of fibers. This makes it easy for your feline friend to get rid of messy hairballs. If your cat is picky, you may sometimes have to decide between dry or wet cat foods. This cat food is available both as canned cat food and dry cat food, providing great taste and nutrition in various formats. It is suitable for adult cats and those cats from ages 1 to 6 years. 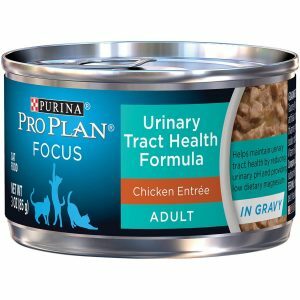 It has real chicken and natural ingredients and is specifically for cats with urinary tract problems. By preventing urinary tract infections – which is common among adult cats – it helps your feline maintain fine health. 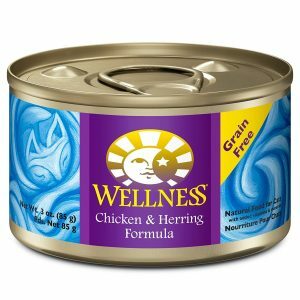 This wet cat food is what you need to provide an excellent source of protein and essential fatty acid for your cat. Each meal of the Wellness Wet Cat Food will help you cat derive the balanced nutrition that’s needed to fuel growth. The key ingredients in this food are all natural. No artificial flavors, colors or preservatives are added and supporting ingredients include essential vitamins and minerals, carrots and potatoes with cranberries and blueberries for a boost in your cat’s urinary tract health. This grain-free cat food is better for your cat’s overall health! 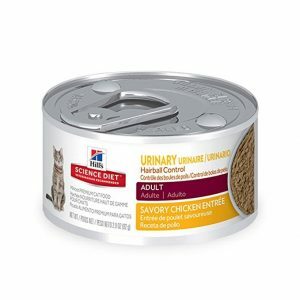 Because hydration is an important factor in how much your cat respond to food in terms of growth, feeding your cat a canned cat food like this increases your cat’s moisture intake. Not only will you not worry about dehydration in your cat, but you’ll also be providing her a well-balanced food that supports her throughout her life. The Royal Canin Urinary Cat Food is specifically for cats with urethral issues and urinary issues like urine crystals. It helps in dissolving the crystals and takes them out of your cat’s urine by making the urine slightly acidic. There is a high percentage of water content (about 64%), which helps to reduce the concentration of minerals in the urine as well as combat cystitis and prevent crystalluria. Because of its low-calorie content, the Royal Canin Feline Food offers a good diet for healthy weight gain. It also helps increase the urine volume so that your cat’s urinary system is free from calcium oxalate. By promoting an atmosphere that’s unbearable to crystals to develop, your cat’s kidney and bladder are healthy all day long. According to PurinaOne, the Purina Pro Plan Cat Food can help reduce the urinary pH of your cat and provide low dietary magnesium so your feline can maintain good urinary health. Offers your kitty a savory gravy dish that’s tasty and nutritious. It also contains prebiotic fiber, which promotes digestive health for your cats overall well-being. The Purina Pro Plan Wet Food is specialized nutrition to meet cats of different ages, lifestyles, and unique needs. With the balanced nutrition offered by this cat food, your cat’s immune system will be strong and the urinary pH levels will be low. Like most wet cat foods, this food comes with high water content. This means increased moisture intake for your cat, optimizing his or her urinary tract health. This is an adult blend food with real chicken that’s easily digestible. It comes with lots of Omega-6 fatty acids that help promote healthy skin and coat. 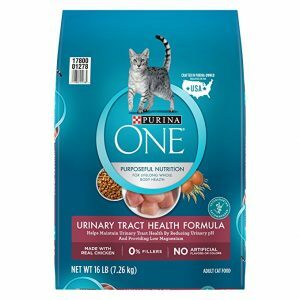 Purina One Formula Dry Cat Food helps lower the risk of blockages by lowering the ordinary pH of urine and provides low dietary magnesium to improve your cat’s urinary tract health. With the combination of this, your cat has a chance to live longer. Unlike others of its kind, it’s designed to help cats with sensitive systems and urinary tract problems enjoy a great taste and proper nutrition. Here are some frequently asked questions about treating cat’s urinary tract problems. Can my cat's UTI go away on its own? To reduce your cat’s discomfort and suffering as much as possible, always consult a veterinarian. The UTI might be a side effect of another underlying illness. Can I treat my cat's UTI at home? It is best to visit your veterinarian to treat your cat’s UTI. You just don’t know if the UTI is worse than your cat’s symptoms lead on. Also, to effectively eliminate your cat’s urinary infection, oral antibiotics will likely be administered. However, you can help treat your cat’s UTI at home holistically by adding a 1/4 teaspoon of organic apple cider vinegar to your cat’s water bowl. The acidity can help break up any present UTI crystals and disinfect your cat’s urinary tract. Apple cider vinegar also supports healthy bacteria – like a prebiotic, which will help replenish healthy bacteria in your cat’s gut. How long does it take for a cat's UTI to clear up? 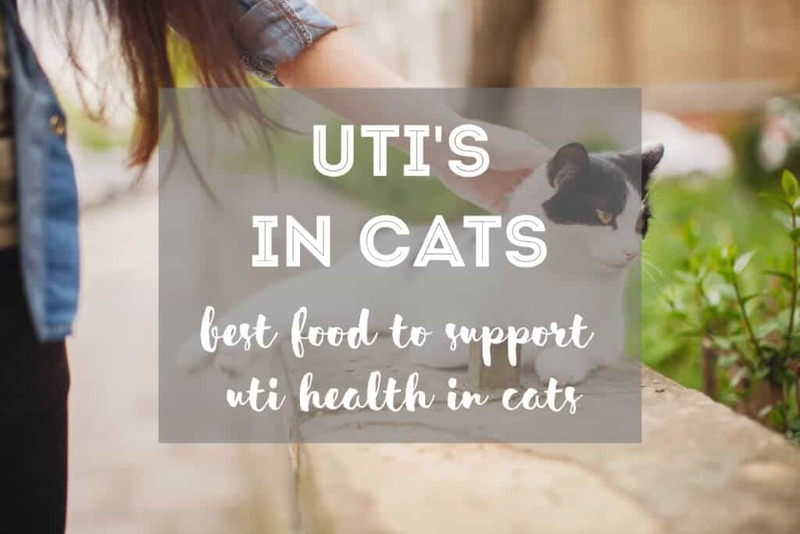 Typically, a cat’s UTI will take anywhere from 2-3 days to 5-6 days to clear up, depending upon the severity of the infection and the effectiveness of the antibiotics or treatment. The best food for your cat’s urinary health is one that’s grain-free, low in magnesium but high in moisture. The reason is that dry cat food can lead to FLUTD, so it’s better to choose something that’ll keep your cat in good health and be at low risk of more diseases. Your cat needs some sort of hydration because of their urinary tract and only a high quality canned food or a balanced raw diet can provide adequate health for your cat. Also, adding a small amount of water to your cat’s favorite food can improve digestion too. When transitioning to a new food for your cat, do so gradually. The best way of phasing out the old food is to do it over a week or two, adding the new food and gauging your cat’s response.